The Wall-Saver safety cylinder: where did that come from? Kind of like the Pocket-Safe hammer shroud the Wall-Saver safety cylinder seems to solve a problem that the industry has already solved. Can’t you buy snap caps? Or a blue gun, or one of the many “training” guns out there? Sure. But none of those are as good as this! When I was a reserve deputy with my local sherriff’s office (something I only gave up because we moved, and will return to someday! ), I got regular department-wide updates on occurrences in the county. And “people shooting holes in the walls of their apartments” was way, way more common that I was comfortable with. You didn’t get as many reports from single-family homes, which I presume was because that’s easier to just patch up and pretend, since there’s no apartment on the far side of the wall. Most of the people involved were good people who made a dangerous mistake—they had swapped out their snap-caps for live ammo and then just forgotten. These folks probably didn’t have the money to spend on a dedicated “training” gun that would let them pull the trigger without firing. And even if they did, who’s to say the trigger pull would have been the same? And while “blue guns” are cheap, I’ve seen for myself that their dimensions can be questionable—one of my classmates at the academy simply COULD NOT draw a blue gun from his duty holster, even though the real thing came out fine. 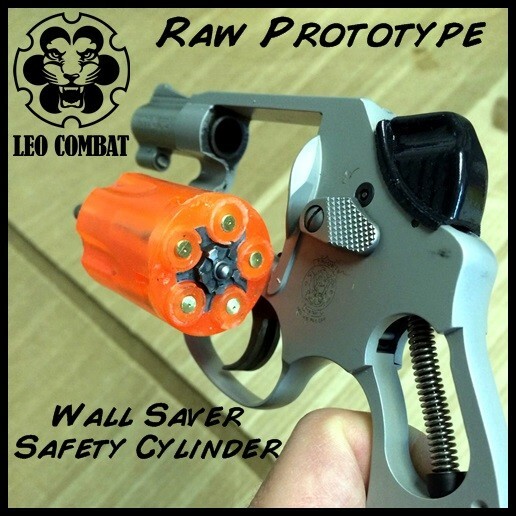 So in order to improve the safety of training in your own home, let concealed-carry instructors familiarize students in a safe way, and offer LE a safe and realistic option for their defensive-tactics classes, I created a “safety cylinder” with integral snap-caps that can be installed as easily as you might remove the cylinder for cleaning.